Posted on May 13, 2015 by Amanda W.
On May 11, 2015, Gov. Tomlin was joined by members of the West Virginia Legislature, Craft Brewers, and Tourism Industry Partners for the signing of two bills SB 273 and SB 581. For WV Craft Brewers, the signing of SB 273 allows craft brewers to sell and refill growlers (64 oz), it reduces licensing fees by basing them on production and eliminates bonding requirements. Craft beer enthusiasts will now be able to purchase WV craft beer in growlers at a variety of retail venues throughout the state. In addition, Gov. 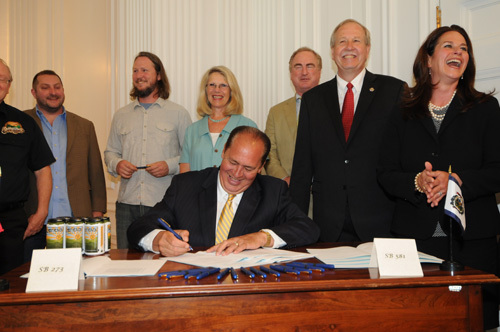 Tomblin signed SB581 bolstering the West Virginia Tourism Promotion Fund, which will support marketing and advertising efforts for a robust regional and national campaign. For more information on West Virginia ABCA requirements and application to sell draft beer in growlers, please click here. 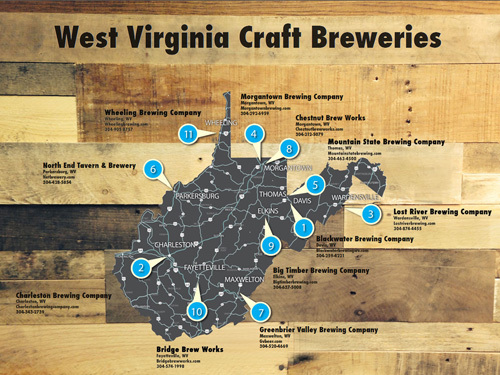 This entry was tagged Blackwater Brewing Company, Governor Tomblin, West Virginia Craft Beer. Bookmark the permalink.